Support remote computers by analyzing issues real-time. Instant remote support right from the help desk tickets. Improve your ticket resolution time immensely. Zoho Desk + Zoho Assist. Ensure Customer Happiness. The seamless integration of Zoho Assist with Zoho Desk helps you identify what exactly went wrong at your customer's end. This can make a marked difference in resolving tickets as you need not assume the issue anymore. No more waiting for screenshots or endless support threads or juggling between multiple softwares. Instant Remote Support is just a click away. All it requires is a single click to start a remote support session right from the ticket. Your customer receives an email instantly and once he or she joins the session, you can jump in to troubleshooting immediately. Solve your tickets easily from Zoho Assist. You can mark the ticket status, edit ticket resolution and add session notes right from the remote support session itself. Once the session ends, the session details along with your notes get added to the comments section of the respective ticket. Why choose Zoho Assist integration in Zoho Desk? 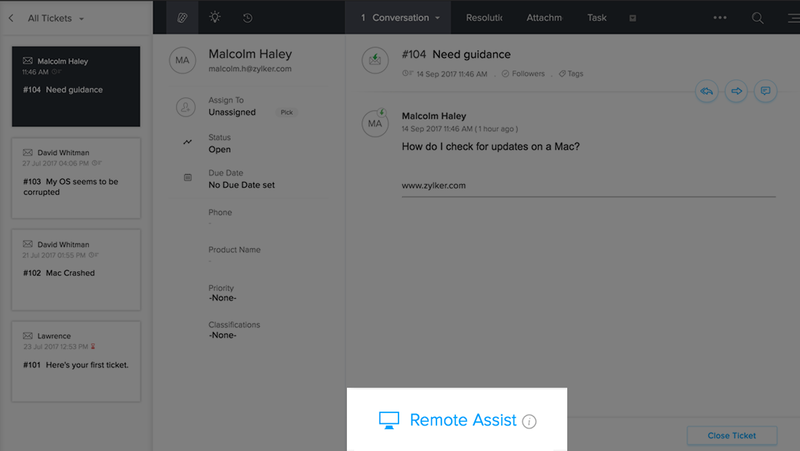 With Zoho Assist and Zoho Desk, you can easily access remote computers, servers and iOS/Android mobile devices and support your customers from the cloud. Looking for a step-by-step guide?